Finn and Tess decide to help out their busy parents - by cooking them a special feast! Rav and his mum help the twins to plan and cook the meal, and they can't wait to surprise their mum and dad with the food they've made. 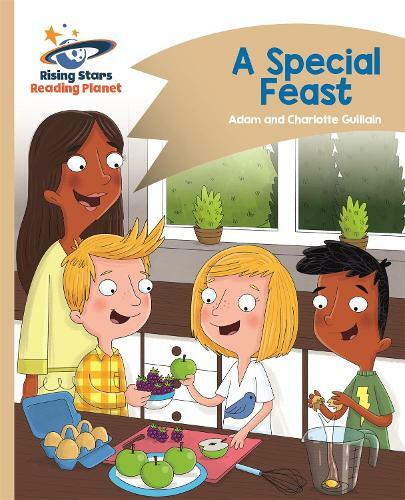 But there might be another surprise around the corner that could ruin everything... A Special Feast is part of the Comet Street Kids range of books from Rising Stars Reading Planet. Comet Street Kids is an action-packed character series with highly decodable books for Pink A to White band. Children will love experiencing the amazing adventures of Rav, Asha, Tess, Finn and Stefan! Reading Planet books have been carefully levelled to support children in becoming fluent and confident readers. Each book features useful notes and activities to support reading at home as well as comprehension questions to check understanding.